“Intersection Repair” uses paint to turn dangerous intersections into spaces shared equally by people and cars. Photo by Mary J.I. 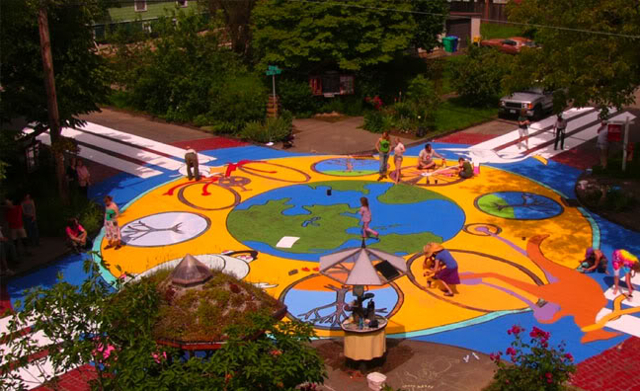 If you have your finger on the pulse of guerilla urban improvements, you have probably already heard of community-led efforts to paint intersections – a beautiful way to reclaim what has traditionally been a dangerous urban space. Known as Intersection Repair, it is not nearly as dry as it sounds. 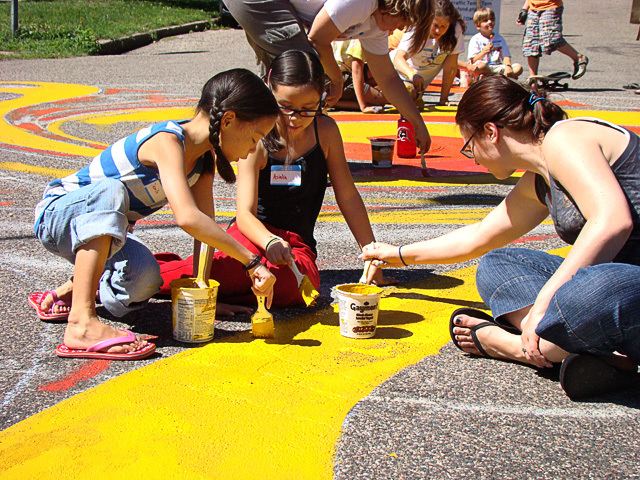 By brightly painting an intersection with colorful designs and pictures, residents can slow down traffic and create a safe, central public space, not to mention one fun day involving the entire community and several buckets of paint. Brightly colored intersections work to slow cars down for a few key reasons. 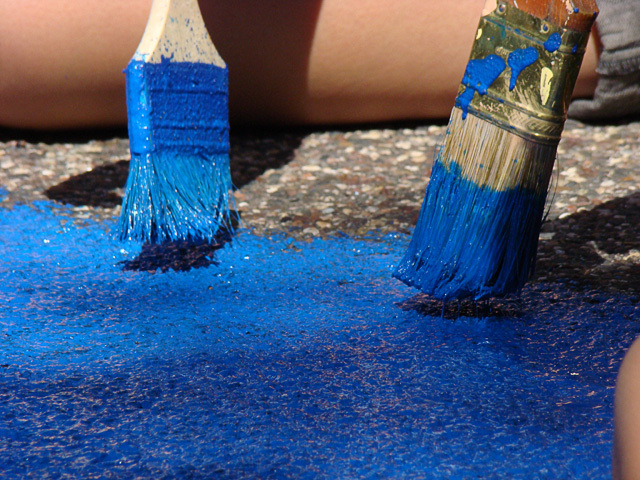 Coloring the road brightly can make drivers wary of whether they really own the road and more cautious of whether other road users— pedestrians, cyclists, or children at play – might be nearby. Slower, more cautious driving is the result. Monderman believed that removing signs and other traffic indicators from specific intersections would force drivers and pedestrians alike to be more aware while using the road. Instead of telling drivers when to stop or how fast to drive, he advocated influencing the appropriate behavior through street design. Monderman’s work began in the ‘80s in Oudehaske, a small town in the Netherlands where he was called in after two children had been killed by speeding motorists. Monderman declined to add more speed bumps and traffic signs. Instead, he made the road appear narrower by adding ditches on either side that could be used by cars, but didn’t appear to be part of the regular road. Other subtle changes – such as missing curbs and cobblestone streets – cued drivers that they were passing through a small village, compelling them to drive slowly. Without signs, Monderman argued, planners shift the responsibility of sharing the space to the drivers and walkers themselves. For many, removing signage is such a foreign concept that it is difficult to implement. But painting intersections is a good step in the right direction, which can serve some of the same functions as removing stoplights. In his book, Biophilic Cities, urban planner and sustainability advocate Timothy Beatley makes the case for these seemingly whimsical, community created squares. “Research has shown that compared to conventional intersections, these unique neighborhood spaces encourage walking and bicycling, foster new interpersonal connections, and deepen a sense of community,” Beatley explains. In parts of some cities, streets are the only public space available to neighbors. Painting these intersections turns those streets into public spaces that can be enjoyed by people and still utilized by cars, albeit at a slower, safer pace. “Intersection Repair” began in Portland, OR, as part of a City Repair program. It has since spread to many states and countries. Photo by City Repair.